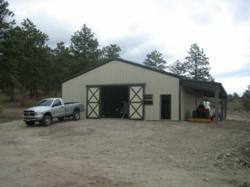 Armstrong Steel, a Colorado based OEM manufacturer of metal building kits, was selected by Will and Nancy Kay to help build the barn of their dreams in the Heart of the Rockies. Armstrong Steel loves engaging with Colorado customers as Colorado is the proud home of Armstrong’s Headquarters. We are so impressed with how sturdy our Armstrong Building is! Will & Nancy Kay’s metal barn boasts Arcadian slider doors, a lean to, skylights, and Armstrong’s commercial insulation package. Traditionally, barns were made out of wood, but the Kay’s opted to go with steel because of the benefits of building with steel. Steel is the perfect choice for building a barn because it is the most cost effective: it requires undemanding maintenance, has a higher resistance to the elements, and it’s easy to customize/expand. Initially, the Kay’s were concerned about insulating the barn for the sake of their horses. Salida, Colorado is one of the top U.S. cities in terms of largest differences between daily temperature highs and lows. They wanted to make sure that everything in the barn would be sheltered from the severe weather. Insulating your building can be expensive if you do it on your own, but Armstrong’s commercial insulation packages are designed specifically for their metal building kits. Armstrong Steel offers reasonably priced insulation packages, along with a myriad of other additions, which can be added to any building. Every Armstrong steel building is unique and customized especially for you without breaking the bank. “We are so impressed with how sturdy our Armstrong Building is! The shipping department was a pleasure to work with and always answered the phone when we called with a question. We're really glad we didn't cut corners and went with Armstrong's commercial insulation package as it is staying quite warm in our building as temperatures begin to drop here in Salida, Colorado," says Will Kay, satisfied Armstrong Steel customer. "If there’s one reason we have done better than our peers in the pre-engineered steel construction industry over the last seven years, it's because we are hyper focused on the customer experience, and that really does matter, I think, in any business. We love it when people count on us. We see our customers as invited guests to a party, and we're the hosts. It’s our job every day to make every important aspect of the customer experience a little bit better," says Ethan Chumley, President of Armstrong Steel. Armstrong Steel offers building solutions to meet every need, large or small. Armstrong Steel also pioneered the industry, offering a 50 year structural warranty on all of its buildings. The quality of an Armstrong building is incomparable making it an easy choice when it comes to all of your building needs. Armstrong Steel has grown from a small metal buildings supply company to America’s leading pre-engineered metal building OEM manufacturer. Armstrong’s insistence on low prices and excellent quality catapulted them into national prominence - it was those low prices that allowed them to expand into new markets in the years that followed. Armstrong's OEM process is unique in that they staff in-house draftsmen and detailers that work solely on Armstrong Building Projects. The sheer volume of material Armstrong Steel purchases from these mills allows us to pass along the absolute best pricing in the industry. To top it off every Armstrong Steel Building is backed by the Best Warranties in America. Armstrong Steel is in complete control of their own specifications, measurements, standards, and guidelines for every single piece of your building: all individual primary members, secondary members, connections, clips, and weld specs in your steel building.